Tone on tone screen printing custom t-shirt is a nice way to make a traditional one color image pop. It takes a cool colored t-shirt but really any color will do, and then either a lighter ink or darker ink depending on the shade of the shirt. For darker shirts a lighter ink of the same shade is used and on a lighter shirt a darker shade of the same ink is used. To make it simple a light blue t-shirt with a slightly darker ink is what we are talking about. You could even use Royal for the ink color but the closer the tone sometimes the more pop even though you’d think that would be the opposite case. Kirkwood Trading Company specializes on options when we have a customer who is stumped with their custom t-shirt design. We like to assist using our many years of screen printing experience. A lot of times our customers stay safe with their ink colors. If it’s their company logo sometimes they don’t have a choice. Other times they can tinker. But other times customers are looking for the latest and greatest or just something new to them. 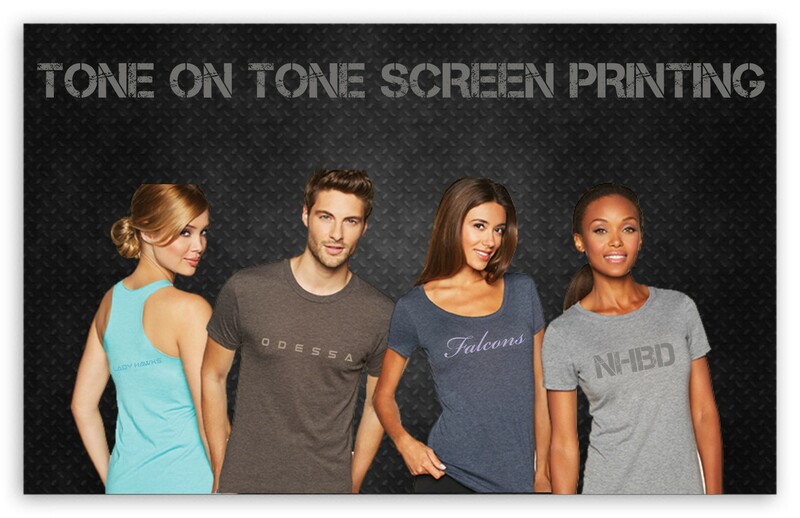 Tone on tone screen printing is just a fresh approach to any kind of logo or design. In addition to the look of the shirt it also has the tendency to possess a really light coat of ink making it a more retro feel and look as well. There is no extra cost for a tone on tone print unless it’s a combination of a lighter ink on a darker garment which would depend on the specific garment color.